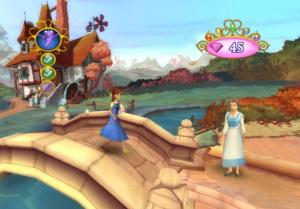 Disney has a long history of using video games to place its familiar characters into unfamiliar contexts, often mixing several disparate worlds together for the sake of effect. The best part? It quite often works. 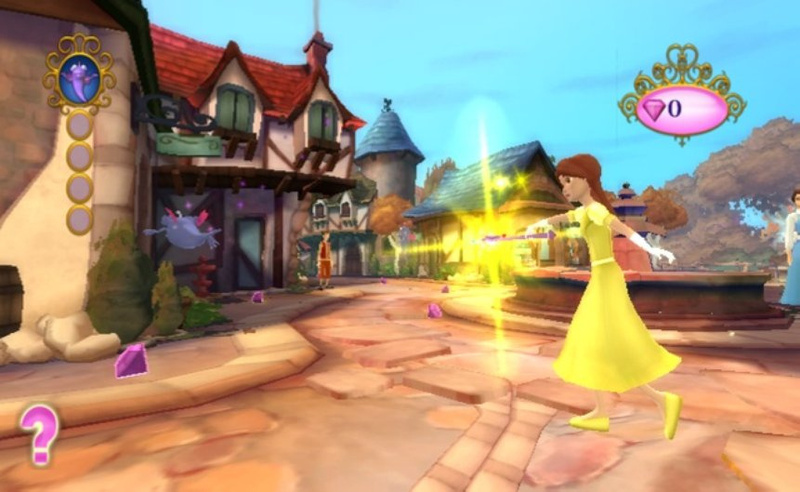 From Mickey Mouscapade to the Kingdom Hearts series to the upcoming Epic Mickey: Power of Illusion, it's usually great fun to see heroes and villains working together and clashing in unexpected combinations. Of course, that doesn't mean the concept is fool-proof, as Disney Princess: My Fairytale Adventure seems dead set on demonstrating. 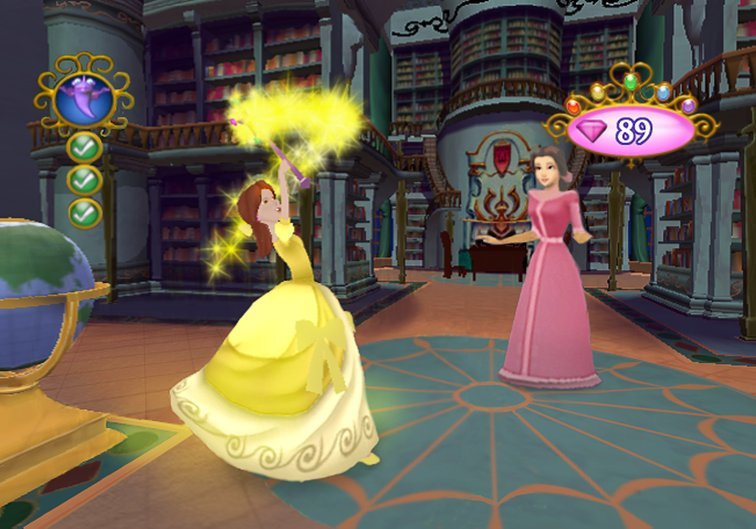 Disney Princess: My Fairytale Adventure is quite literally a game starring you. One of your first tasks is to design an avatar that you'll control throughout the game. 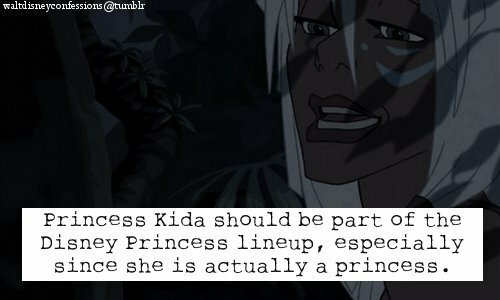 Of course, since you're the protagonist and this is Disney, it's impossible to create a character that's anything less than moderately gorgeous, which may help to reinforce a host of body image issues for yet another generation of young girls. You play an apprentice to the Fairy Godmother of Cinderella fame, and one evening as you toil in the garden you accidentally turn a fairy into a mischievous imp. We've all been there, right folks? In an attempt to restore the creature to mindless, hovering goodness, you accidentally turn a whole slew of other fairies into imps as well, and if you don't change them back fast they'll get up to all manner of trouble... such as flying in circles and waiting for you to show up and fix things. So it's not exactly a fate worse than death, but let's not be picky. That's the main plot of the game, and as you can tell it's devoid of tension by design. Disney Princess: My Fairytale Adventure doesn't want to scare anybody, and we understand that, but it would at least be nice if there was some sense that this adventure was worth having. As it stands, it just seems like the fairies got a little uglier. Hardly the stuff of urgent panic. You're guided on your quest by the Fairy Godmother, whose voice actress stumbles over her lines and emphasises bizarre syllables, making it feel like you're hearing the first take of a non-English speaker trying desperately to sound out a script. It would actually be quite funny if she didn't interrupt the gameplay every few seconds to remind you of what you're supposed to be doing, often in tandem with unskippable text boxes or cut scenes. Before long you'll be led to the Portal Room, where there is no cake and the imps are fleeing into various alternate dimensions based on films such as The Little Mermaid, Tangled, and Beauty and the Beast. It's a sound concept, as exploring these worlds should make for some interesting and varied gameplay, but the sense of adventure really dissipates when you realise that each world is just a series of simple — and tedious — fetch quests. Collect some of these, destroy some of those, and move on to the next pointless task. When your main levels are no more engaging than your hub, your game has issues. 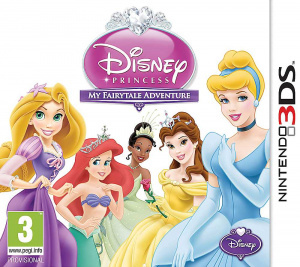 Unfortunately, that's just the tip of the iceberg, as Disney Princess: My Fairytale Adventure is barely playable, and always seems to be on the verge of crashing your system. For a game designed in 3D, for instance, it certainly doesn't seem to have been tested in 3D. Nudging that slider up anywhere beyond 0 results in a frame-rate that's genuinely game-breaking. Everything slows to a laggy, jumpy mess, and if you do choose to push forward in 3D you'll find that many sequences — seemingly at random — are rendered in simple 2D anyway, with no depth effect whatsoever. It's the gaming equivalent of watching a film the keeps switching from colour to black and white and back again, not for any artistic reason, but because multiple teams worked on the film and didn't discuss ahead of time what the finished film was supposed to look like. The camera operates with a will of its own, never pulling back far enough to show you the entire environment. That would be fine, if it weren't for the fact that any given area is littered with invisible walls, meaning you'll have to walk everywhere, in every direction, before you'll know where you can and can't go... even though the entire area looks wide open. The camera will also regularly float into — and often get stuck in — ostensibly solid objects, showing you the glitchily rendered interiors of stones, walls, and even people. Loading times are also preposterously long, often making it feel like you're running this game from a cassette tape. 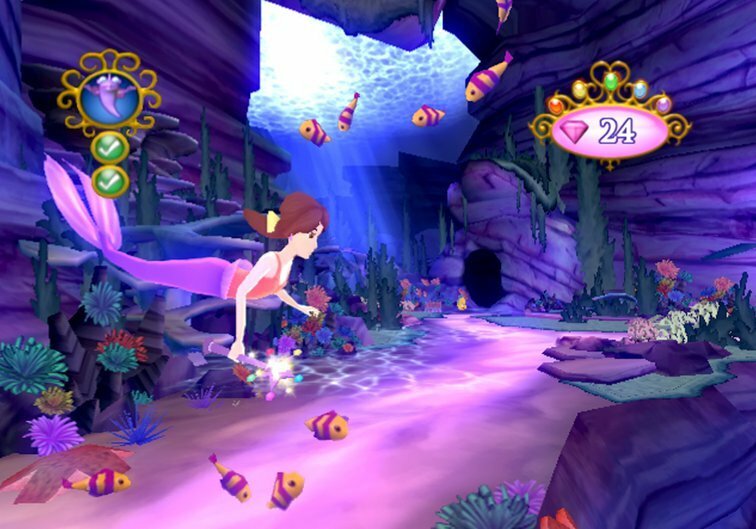 The controls are sluggish, with your character jumping or waving her wand sometimes a full second after you tell her to do so, and interacting with things is random and irritating: most objects, even if they seem like you should be able to do something with them, do nothing. Others simply trigger another long, unskippable explanation from the Fairy Godmother, who still sounds like she's struggling to string together her first English sentence. There are some additional and optional tasks to perform, but they don't so much break the monotony as provide another flavour of it. 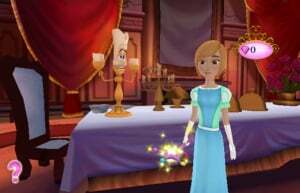 You can customise and redecorate your bedroom in the castle, for instance. 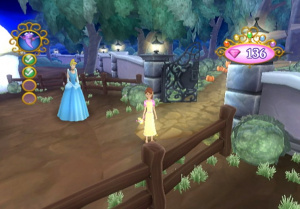 You can also visit your garden to plant new flowers, which is certainly what one should prioritise after accidentally unleashing a terrible spell upon the kingdom. And you can continually give your character plastic surgery, changing her facial features whenever you feel the desire to do so. 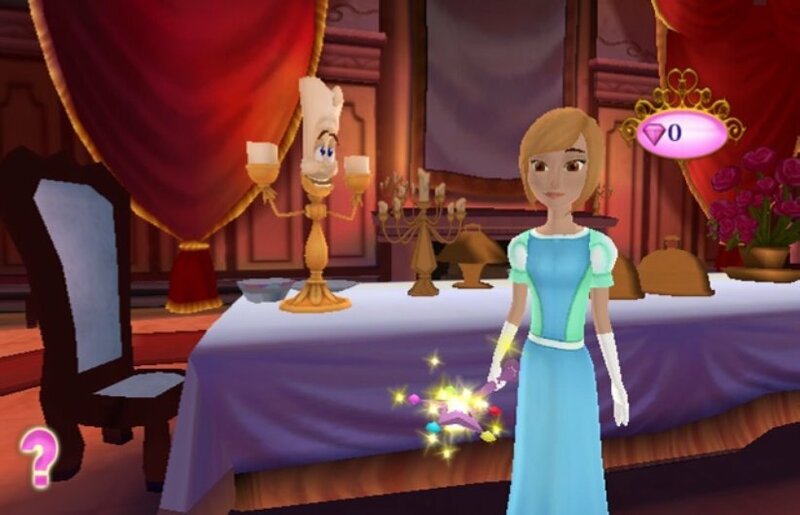 Her wardrobe is also yours to select as you unlock new items along the way, and if you predict that your lowly apprentice character will eventually blossom into a beautiful princess, then well done. Give yourself a cookie. Disney Princess: My Fairytale Adventure sounds fine on paper. You get to explore whole new worlds, and interact with your favourite characters from classic films. Unfortunately it really just proves the old adage that you should never meet your heroes; they'll only disappoint you by sending you on fetch quests, glitching through the floor, and being impaled by a chronically confused camera. Crawling with glitches, slowdown, repetitive gameplay, disinterested voice actors and stiff controls, Disney Princess: My Fairytale Adventure is less a game than it is a mess of unfinished code. Young gamers will likely get a kick out of interacting with their favourite characters, but it's a magic that fizzles all too soon when the adventure is this uninspired. There are many opportunities to customise small aspects of the game, such as your character's appearance and a bedroom you can decorate, but it's simply not worth the effort. This is one Princess that's quite simply not worth rescuing. @KaiserGX I can see it now....still gonna buy it, say something about the review, say HAPPY GAMING (^_^)....MISS THAT IS NOT GAMING! @undead_terror Maybe she, you know, actually enjoy these games? Despite the reviews? My, my, my. It's very bad. D'aw I was hoping this would be good I guess I'll have to buy someting else be a pretty Princess this year. Honestly, I didn't even know this game existed until now. Lol. Why did you even bother reviewing this game? Outside of the Disney license, it's about as low-key of a retail release as you can get. How disappointing, I was hoping this would be decent, at least I've still got Power of Illusion to look forward too. Sounds like a Day 1 to me. I've always wanted to be a 2D/3D princess. @BulbasaurusRex Sometimes you gotta take the rough with the smooth. You would think that Disney Interactive has learned something from collaborating with Square. @Barbiegurl777 I like that you close all of your comments with "Happy Gaming! (^_^)". It makes me smile when I see it. So thanks. I just love bad games. They always give me something to rant about. Hoping for Code of Princess. Get Disney Princess instead. "Loading times are also preposterously long, often making it feel like you're running this game from a cassette tape." Sometimes its just fun to read a review of a game we all know is going to be bad... Maybe upper management forced Phil to play and review this game out of punishment for doing something bad. Did he over-feed an office fish? Btw BarbieGirl send me more Art Academy drawings. I got your cherry. Lol was this even worth writing a review about? @photofool83 It makes me frown. This is disappointing considering some of Disney's worst films/franchises have received some fairly decent games over the years. Really. Did we expect anything more? I'll be a Princess Die and die with you. I'm waiting for Game Of the Year Edition. Even though she is in the middle, why is Tianna in the back? (snaps fingers)Riddle(dramatic pause)...me..that? Whoa. That's bad. I hadn't seen a 2/10 on NL yet. BTW, the article was great to read. It made me chuckle quite often. @theblackdragon and this is why I love nintendolife. I was considering it for my daughter. Now we can put her allowance to better use or game. Thank you NL! Thanks for taking one for the team.....someone had to do it. thanks for the cookie anyway, i don't usually trust games with disney labels. i didn't like many of them.